A large cross of clouds over the Kursk Root hermitage attracted attention of multiple pilgrims who gathered together to meet the Wonderworking Kursk Root Icon. The cross could be seen in the sky over the monastery at Wednesday night when Patriarch Kirill of Moscow and All Russia brought to Kursk the miraculous icon which was kept in Russian foreign parishes for about 90 years. Two white lines crossing at a straight angle were clearly seen in a dark blue evening sky; they resembled the trace left by aircrafts. Eyewitnesses noted the intensity and geometrical accuracy of the crossing lines. This celestial phenomenon could be seen over the monastery within half an hour. The cross in the sky over the Kursk Root hermitage was widely discussed by pilgrims the next day when the Wonderworking Kursk Root Icon was brought to the hermitage. 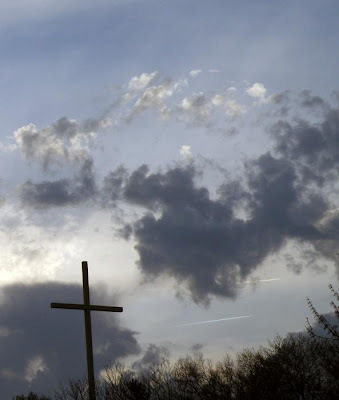 An Interfax-Religion correspondent talked to some participants of the celebration, and they all see this cross of clouds as a sign of grace of the Holy Mother.